James John Morgan was William Morgan's younger brother (Four years younger). They were both born in Utah. James and his wife Amberzine signed William and Lovina Morgan's marriage certificate as witnesses. James John Morgan was born 1 Feb 1860 in Goshen, Utah County, Utah. His parents, Thomas and Ann Watkins Morgan, were among the founding pioneers of Goshen, located about 30 miles south of Provo. When he was about 6, in 1866, his parents and family moved to the newly founded community of Deseret in Millard County, Utah. 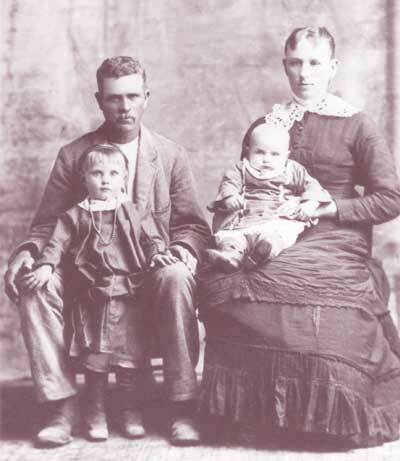 About two years later the family founded another community in Millard County, later called Oak City; and by about 1872, when John was 12, his family founded Leamington, Millard County, Utah, where James John grew to adulthood. Indeed he had spent his entire childhood in frontier settings, living at times in dugouts, forts, and simple adobe or log houses. Boys in such frontier Mormon villages worked hard in helping their families clear new farmland of brush and rocks, gather firewood, and help with irrigation and numerous other chores. Frontier life and hard work continued into adulthood as James John and his new wife joined his older brothers Edward and William Morgan and other family members in a move to new land in southern Idaho in about 1882. James John married Amberzine Kimber Gustin in Leamington, Utah, on 16 February 1879. She was the daughter of Thomas and Martha Green Gustin. She was born in Nephi, Juab, Utah, in about 1864. In the 1880 census her mother Martha was living in the home of Thomas Morgan and his second wife Nancy Jane Radford Morgan and was identified as an invalid. Martha was later identified in Millard County records as an "insane woman" living in the home of Thomas Morgan. As the extended Morgan family was getting larger and land was limited in Leamington, the young couple decided before they had a family to join with relatives and other pioneers from Leamington and make a move to raw land on Southern Idaho's Snake River Plain. The community they founded there became known as Neeleyville (now Neeley) near what is now American Falls. While living there they had their first child, Minnie Pearl, in October of 1882. James John and Amberzine Gustin Morgan with first two children, Minnie Pearl and Laura Ann. Taken about 1886. Though good soils and irrigation water were more abundant and promising in Neeleyville than in Leamington, the young James John family nevertheless left Neeleyville in about 1884 and returned to Leamington where they remained until about 1888. Their second child, Laura Ann, was born in Leamington in February, 1885, and their third, James Franklin, was born in Leamington in March of 1888. In the fall of 1888 or spring of 1889 the James John and Amberzine family migrated to Wyoming where, by the summer of 1889, nearly 60 of his Morgan and Radford relatives had settled in a community north of present-day Freedom, now called Etna. While in Wyoming they had their fourth child, Lillian Amberzine, in Feb. of 1890 in Freedom, Uintah (now Lincoln) County, Wyoming. In 1891, after two very severe winters in Wyoming, the James John and Amberzine family, along with most members of the Morgan family gave up on Wyoming and settled in the eastern Idaho community of Shelton, near present Ririe. While there, he and his young family again started over, clearing new land and pioneering a new community that had been founded only a few years before they arrived. Before 1910 he and Amberzine had four more children, all born in Shelton (see list of children below). The 1910 census of Willow Creek Precinct, Bingham County, Idaho, lists the parents together with four of their children still living at home. Also in the same household was his older brother Edward Morgan and wife Sarah. In 1910 or shortly after, James John and Amberzine divorced. This was somewhat unusual at the time, especially after they had had at least eight children, the youngest of whom, Lawrence, was born in 1908. In the 1920 Federal Census, Amberzine was living in Long Beach, California, with her two sons, Alton 21 and Lawrence 11. She died 1 February 1926 in Klamath Falls, Oregon. Her remains were shipped to the Ririe-Shelton Cemetery where she is buried next to her mother, Martha Green Gustin, but not next to her ex-husband. In about 1912 or before, James John obtained work in Montana. While there he remarried on 4 June 1912 in Dillon, Beaverhead, Montana, to Ruth Dennis Wilbur Bigham. Ruth and James were well acquainted while living in eastern Idaho as she was a daughter of the woman (Susan Byington Wilbur) who married James' father, Thomas Morgan, when he was elderly. Ruth was born 23 June 1875 in Eden, Weber, Utah, daughter of Stephen King Wilbur and Susan Byington Wilbur. She first married on 7 Oct. 1890 to Rufus James Bigham. She and Rufus had nine children while living in Albuquerque, New Mexico, but she was divorced from her first husband at the time she married James in 1912. She died 19 October 1959 in Menan, Jefferson, Idaho. At that time her obituary lists her survivors as Charles Bigham of Pocatello, Idaho, and a daughter Mrs. LeRoy Tanner of Menan, Idaho. Records indicate that only three of her children with Rufus lived to adulthood. 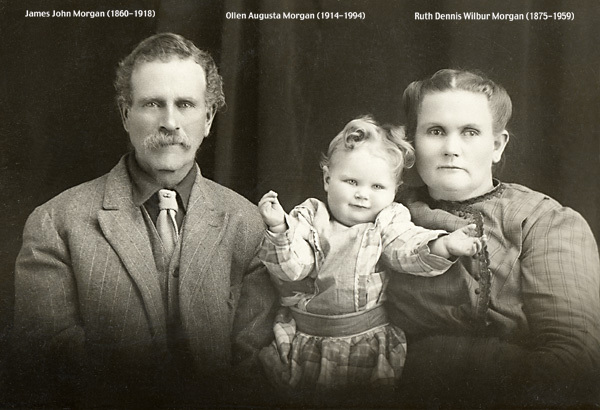 By 1914 James and Ruth had returned to Shelton where their daughter Ollen Augusta Morgan was born on 4 January 1914 in Perry Ward near present Ririe, Idaho. James John died 7 May 1918 near Ririe, Idaho, at the age of 57. He is buried in the Ririe-Shelton Cemetery. The Bonneville County Probate Records listed the heirs of James John Morgan in 1926 as follows: Ruth Morgan, widow, 51 years, Pocatello, Idaho; Pearl Potter, dau., age 43, Bridge [Cassia], Idaho; Laura Ellis, dau., age 40, American Falls, Idaho; Lillie A. Carson, dau., age 37, Klamath Falls, Oregon; Ida Ellis, dau., age 34, Klamath Falls, Oregon; Myrtle Ferguson, dau., age 29, Rigby, Idaho; Alton Morgan, son, age 27, Klamath Falls, Oregon; Lawrence Morgan, son, age 18 Burley, Idaho; Ollen Morgan, dau., age 12, Ririe, Idaho. It is not known why Ollen was not living with her mother in 1926. Eastern Idaho marriage records show that Ruth married her second husband's brother William Morgan of Rigby, Idaho, on 15 May 1928. Unwritten oral histories indicate that this marriage lasted only a short time. 1. Minnie Pearl, born 10 Oct. 1882 in Neeley, Oneida (now Power), Idaho, and died 5 July 1964. She married Clarence Lucine Potter, 18 Oct 1898 in Rudy, Jefferson, Idaho. He was born 25 Dec. 1872 in Livermore, Iowa, and died 22 March 1939 in Bridge, Cassia, Idaho. For about the first 10 years of their married life they lived in several mining towns in Arizona. They came back to American Falls, Idaho, in about 1910 but later moved to Couer d'Alene, Idaho, and then to Declo in Cassia County, Idaho. They had the following children, surname Potter: Delores Montana, b. 1 June 1900, Jerome, Yavapai, Arizona, and died 9 Sep, 1967, Burley, Cassia, Idaho; Otto Lucine, b. 25 May 1902, Pollen, Arizona, and d. 4 July 1902; Jess Doran, b. 6 July 1903, Nogalas, Sonora, Mexico, and died 8 March 1959; Minnie Lenora, b. 10 Feb. 1906, Douglas, Cochise, Arizona, and d. 21 Mar 1966; Laura Nell, b. 25 Sep. 1910, American Falls, Idaho, and d. 9 July 1972; Mabel Mary, b. 14 Oct. 1912. Coeur d'Alene, Idaho; Morgan Leslie, b. 21 Aug. 1915, Declo, Cassia, Idaho. 5. Ida Mea, born 10 August 1892, at Shelton, Jefferson, Idaho, and died 17 Oct. 1949. She married William Ellis on 2 January 1912. He was born 8 March 1883 in Providence, Cache, Utah, the son of William H. Ellis and Annie Elizabeth Buetler. In 1926 they were living in Klamath Falls, Oregon. He died 2 May 1953 in Klamath Falls, Oregon. 6. Myrtle Luella, born 29 Oct. 1895, Shelton, Idaho, and died 28 June 1970 in Idaho Falls. She is buried in the Ririe Shelton Cemetery. She married George Henry Ferguson on 29 April 1911 at Ririe, Jefferson, Idaho. He was born in Logan, Cache, Utah, 8 Oct 1890, the son of Albert and Mary Gneiting Ferguson. He died in Idaho Falls on 19 Nov 1984. They raised a family in Shelton (near Ririe, Idaho) and later moved to Idaho Falls. Hazel M., born 14 July 1912 in Shelton, Jefferson, Idaho and died 25 January 2000. She married Jesse Lorin Blackburn 20 Sept 1929 in Idaho Falls. Two children are listed, Betty Colleen Blackburn born 1931, died 1986 and Gary Jess Blackburn born 1933 and died 2006. There may be other living children. Sarah June, born 9 June 1915, Shelton, died 15 Jun 1915 in Shelton. James Raymond (Ray), born May 18, 1918, married Verla Lenona Heyrend 1 September 1934 in Idaho Falls, died Oct 18, 1995. Verla was born 10 March 1919 and died 20 March 2012. One child is listed, Marlin George Ferguson born 1938, died 2005. There may be other living children. Eldon George (Fergie), born 9 Feb 1923, Shelton, Jefferson, Idaho, married Joyce Daisy June 30, 1944, and died 5 Feb. 1977. Joyce was born 5 June 1924 and died 2 September 2014. There may be living children. 7. Alton D, born 7 July 1898, died in 1945, and is buried in Linkville Pioneer Cemetery, Klamath Falls, Oregon. He was 12 years old in 1910 census in Shelton (Willow Creek), living with his parents. In 1920 he was in Long Beach, California, living with his mother and brother Lawrence. In the 1930 Federal census he was living in a boarding house in Westwood, Lassen, California, age 31 and was single. As an 18-year-old in Burley, Idaho, Lawrence pleaded guilty to forgery and in 1928 was sent to the Idaho State Penitentiary in Boise. After serving 33 months he was released on parole in 1931. He then moved with his wife Wilda to Klamath Falls, Oregon. Wilda died in Burns, Oregon, on 4 March 1939. Lawrence then married Blanche Helen Grimm in 1940 in Reno, Nevada and they had two daughters, Peggy and Patsy. The Social Security Death Index has his death in October, 1971, Klamath Falls, Oregon. Blanche Helen Grimm Morgan was born April 7, 1910 and died September 11, 1984. Click on the link above to see a page with pictures of Lawrence Deloss Morgan and his wife Wilda. 9. Ollen Augusta Morgan, was born 4 January 1914 at Shelton, Jefferson, Idaho. She is listed as a member of the Shelton LDS Ward which recorded her birth date. As a child she is also listed with her mother as a member of the Ririe Ward on 22 July 1928 and she and her mother are shown as moving from Ririe to Rigby in 1929. By that time her mother had married William Morgan, the brother of James John. In her mother's obituary in 1959, Ollen is identified as Mrs. LeRoy Tanner. Her mother Ruth at that time had been living at the home of her daughter Ollen Morgan Tanner for about the last 15 months of her life in Menan, Jefferson, Idaho. Ollen married James LeRoy Tanner 5 Nov 1945 at Black Rock, Idaho. He was born 19 Oct 1901 in Idaho Falls, Idaho, the son of James Monroe and Janette Weeks Tanner. He died in Menan, Jefferson, Idaho, on 9 May 1967. His obituary states that he married Ollen Augusta Morgan 5 Nov 1945 at Black Rock, Idaho. He was survived by his widow and a son Mark James Tanner. The Social Security Death Index shows Ollen Tanner, born January 4, 1914 in Idaho, and died 19 December 1994 in Pocatello, Idaho.